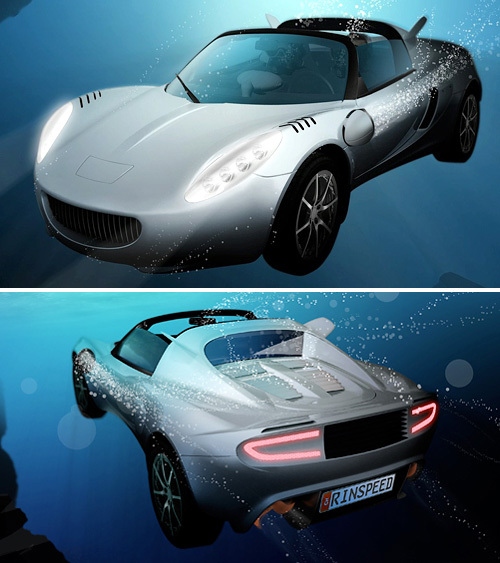 Ever since he saw the underwater car in the James Bond movie, concept car designer Frank Rinderknecht, 52, wanted to create one. Even though it was just a toy model in the movie, Rinderknecht wanted to create one. He worked tirelessly with his team to create this car nicknamed “sQuba”. This car uses the Lotus Elise as it main chassis and they built all the other gadgets into it to make the car run underwater. The car is priced €1 million Euros (£750,000 or US$1,500,000) and can drive up to a depth of 10m. For three decades I have tried to imagine how it might be possible to build a car that can fly under water. Now we have made this dream come true…Everybody knows James Bond and the Esprit but it was always just fiction. We thought, 'Let's do something everybody knows but nobody has tried.'" The "sQuba" will be exhibited at the Geneva Motor Show next month. The original car in the movie “The Spy Who Loved Me”. Photo courtesy 1-18scalecars.com. The “sQuba” Photo courtesy Ohgizmo.com. Rinderknect and his team at Rinspeed company replaced the petrol engine in the Lotus Elise with three electric motors, one to power the rear wheels, the other two to drive the propellers underwater. They can go up to 75 mph in land, 4 mph in “boat” mode and 2 mph in underwater. He claims the car is environmentally friendly product, is a zero emission vehicle powered by lithium-ion batteries. "The passenger compartment is three square meters of air - you'd need to add about three metric tones of added weight to pull it down under the surface. Hence the reason for the slow speeds underwater. Another reason for the open cabin is safety. At one meter depth, the water pressure keeps the door closed and tight, in case of emergencies the occupants will not be able to open the car. The car is designed in such a way, it goes underwater with the help of propellers and when they are stopped the car automatically comes up to the surface. He said the experience of driving under water is just like scuba diving. The firm however has no plans to produce this car in mass production, he just created it for the thrills. But if others are interested, he said they are welcome to use that design. Maybe the next James Bond movie can use this real car underwater.